Located in a former ice factory, St. Augustine Distillery is putting a modern twist on spirits. It’s a small-batch producer of gin, rum, vodka, and bourbon, and has made a name for itself for using local ingredients and for its dedication to quality. You can get a taste (literally!) of the distillery’s hard work and learn about their sustainable practices when you take their free tour. Find out everything you need to know before visiting the site. Plus, discover where you can find the best breakfast in town! The St. Augustine Distillery perfectly embodies the spirit of the Nation’s Oldest City. Old becomes new here, from the building it’s housed within to the barrels that age their spirits. While the distillery’s website does a good job covering the history of this business, you’ll get an even better picture when you take their free tour. The St. Augustine Distillery offers tours every day of the week, starting at 10:30 a.m. and running around every 30 minutes. The tour is kid-friendly and wheelchair-accessible. You’ll start at the distillery’s on-site, one-room museum, which quickly covers the history of St. Augustine as well as the history of the business and the old ice plant. From there, you’ll walk through the factory floor, getting a glimpse of the process from distilling to aging. Seeing the barrels is one of the highlights of the tour, as you’ll learn about how St. Augustine Distillery and the San Sebastian Winery have teamed up to reuse and trade barrels. Last, but certainly not least, you’ll get to sample each and every of the distillery’s spirits. First, you’ll enjoy mixed drinks that use their house-made mixers. After, you’ll head to the shop and bar where you can try their gin, rum, bourbon, and vodka straight. Check out their specialty and limited release spirits while you’re there, and purchase a bottle (or two!) to take back with you. After your visit, head to the adjoining Ice Plant Bar to enjoy a delicious cocktail and a bite to eat. This is one of our favorite bars in town and is definitely worth a visit. Their Happy Hour specials are fantastic as well, so be sure to stop by after touring the distillery! After you’ve explored the St. Augustine Distillery, head back to the gorgeous Agustin Inn for a night of relaxation. 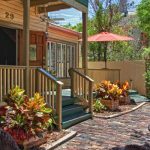 We are centrally located in St. Augustine’s historic district, within walking distance to dozens of incredible restaurants and bars. Whether you’re traveling for work or on a romantic getaway, this is the perfect place to stay. In the morning, indulge in the complimentary two-course, sit-down breakfast. Guests can choose to enjoy your meal on our beautiful outdoor porch or in our charming lobby. The gourmet selections served are designed around fresh and local ingredients, accompanied by coffee and juices. The courses range from a fresh berry parfait with vanilla yogurt to biscuits and gravy. We are happy to accommodate any of your dietary restrictions. Simply let us know upon arrival!